I ran across this product, purchasing it on a whim. I gave it a good, hard stare: I have high hopes for you. It is not easy to impress me with a condiment. Most bottled salad dressings pale in comparison to those made from home. A jar of kalamata spread can be made on the spot at home, just by blending kalamata olives with some olive oil, a pinch of salt and maybe some stray seasonings. A few times in this past year, I have had the pleasure of enjoying a reduced balsamic glaze, often paired with a stand alone wedge of cheese. I even reduced balsamic myself, half a cup or so, in a sautee pan on barely a simmer. It is a rewarding accompaniment. So when I saw this little bottle, I had been primed with good syrup-y balsamic experiences. Not least of which was a dinner over a year ago at Seattle's restaurant: CRUSH. Now there is a cheese plate to entertain. This little balsamic glaze and I are now friends. I just bought my second bottle---which is a high bar to clear---as one can only enjoy so many condiments at a time. 2. Add a depth of flavor to a humble sandwich. BIG accolades from the family: all of a sudden, my son has a new favorite sandwich. The secret really is in the sauce. 3. Add a fancy, zig-zag squirt under---you guessed it---a wedge of cheese. 4. Add a fancy, zig-zag squirt (a rewarding culinary motion) over grilled portabella mushrooms. Winning combo. Now that I have invested in bottle #2, I will likely try it on top of a pasta salad, on grilled potatoes, and on countless sandwiches. If you see it on a shelf, consider trying it. The squirting in zig-zag form alone is a delight. And what is not to love about balsamic? 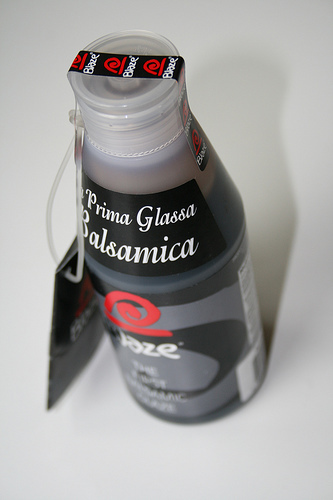 I have always loved balsamic vinegar, and somehow this happy little glaze makes it more accessible. Aug 12 Sometimes we are crabby. Jul 26 a good rub. Oct 12 Not in Italy? But need gelato?